Named for the imaginative builder of our lovely inn, this elegantly decorated room, with rich colors and 14′ high ceilings, was his favorite. The turret sitting area trimmed in original redwood molding and corbels offers remarkable views of Historic Ferndale’s Main Street and Ocean Avenue, and the beautiful bay window brings in light and air. An antique armoire and king bed accompany the English fireplace, adding ambiance and warmth. 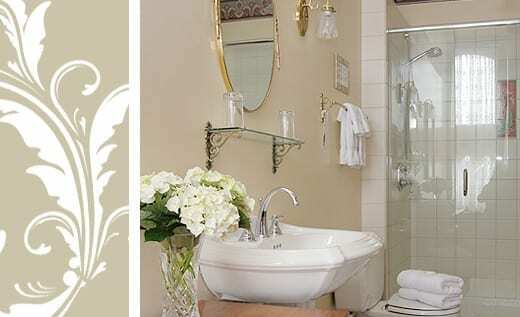 The private bath includes a pedestal sink and a large rain forest style shower.